On this date in 1943 in Salzburg, Austria, Adolf Hitler and Benito Mussolini met for the first time since the col­lapse of the Axis de­fense of Stalingrad at the end of Janu­ary. Ignoring Mus­so­li­ni’s trial bal­loon about nego­ti­a­ting a cease­fire with the Soviet leader, Joseph Stalin, Hitler remained con­vinced that the Euro­pean war would be won or lost in Russia. For his part, Musso­lini had already accepted the inevi­ta­ble loss of his Libyan colony to the Allies, al­though Hitler put a brave face on events in North Africa since the start of the Anglo-Ameri­can offen­sive in Novem­ber 1942 (Operation Torch): “Duce, I can assure you that Africa will be defended. The situ­ation there is serious but not des­perate.” Mus­so­lini could not but cringe in an­xious anti­ci­pa­tion of Allied landings in Sici­ly from their new North African spring­board, an event which his en­tou­rage in Salz­burg believed would be soon. Mus­so­lini requested Hitler’s help in cre­ating a new south­ern army with mo­dern equip­ment and a shield to suffi­ciently pro­tect it against air attacks that would en­sure the fail­ure of any Allied landings in Italy. Hitler, how­ever, had much to gain by keeping the Allies bogged down on the Ital­ian front and offered Italy only moral support. After his two-hour meeting with Hitler, Mus­so­lini met with the Reichs­fuehrer of the SS, Hein­rich Himm­ler. He wanted the ad­vice of the much-feared head of Ger­man police forces on how to sup­press likely inter­nal un­rest due to the length­ening nature of the war. (Italy had already been plagued with worker strikes in the coun­try’s north.) Himm­ler tore a pre­scrip­tion out of his own black book in Ger­many—throw the trouble­makers into con­cen­tra­tion camps. Himm­ler had a low opin­ion of the Duce, be­lieving that Ger­many could not count on Mus­so­lini or his regime any­more. In fact, he pre­dicted that within a few months at most Italy would drop out of the war. Himm­ler con­fided to a col­league that, if the condi­tion of the Duce today (Mus­so­lini took sick the next day) was a reflec­tion of the condi­tion of the Ital­ian people and his Fas­cist regime, then the end was near. It was an eerie pro­phecy, for on July 25, 1943, the Grand Coun­cil of Fas­cism in Rome de­posed the Duce from his leader­ship posi­tion, and Ital­ian king Vic­tor Em­man­uel III placed him under arrest. 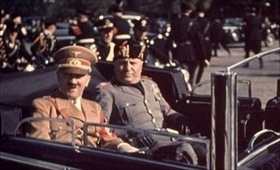 Left: His face expressionless, Mussolini rides in an open-air car with Hitler in Florence, Italy, May 1938. 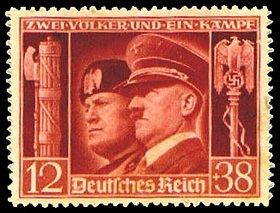 Hitler beamed and strutted like a peacock across his host’s stage, having pulled off his bloodless land grab of Austria (Anschluss) earlier in March after Mussolini had abandoned his northern neighbor to the Nazi predator. 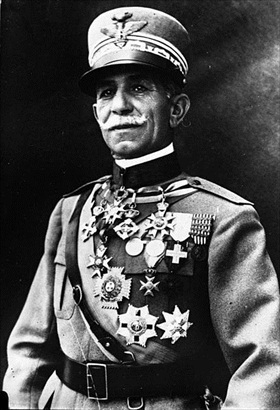 Left: Marshal of Italy Pietro Badoglio. 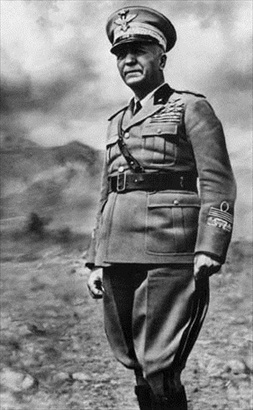 On the night of July 24–25, 1943, two and a half weeks after Allied landings in Sicily (Operation Husky) and a week after Allied air­craft had un­loaded their bombs on Rome, the Grand Council of Fascism voted 19-to-7 to remove 60-year-old Musso­lini from power. Italy’s king ordered the Duce’s arrest the next day, July 26, and appointed 72-year-old Badoglio to be Italy’s new prime minister. Right: King Victor Emmanuel III of Italy. Publicly, the king and Prime Minister Badog­lio claimed that their coun­try would con­tinue the war as a mem­ber of the Axis. Privately, they both began negoti­ating with the western Allies for an armis­tice, which was signed on Septem­ber 3, 1943, but made public on the 8th. Bodoglio’s government declared war on Germany on October 13, 1943.